Century 21 Best Value Realty analyzes the Ortega victory below, citing the effects it might have on the real estate market. We are ready to work together (with the other candidates) to eradicate the poverty of Nicaragua, to provide security to the private sector, to provide security to the diverse foreigners in our country … and to develop relations with the entire international community. Nicaraguans cast ballots November 5th and decided to give Daniel Ortega a second chance as president. Although many remember Ortega as a revolutionary figure of 1980’s Nicaragua, he now espouses Catholicism, professes to be Washington-friendly, and has stated he supports CAFTA. Century 21 Best Value Realty analyzes the Ortega victory below, citing the effects it might have on the real estate market. Ortega, himself a large land owner, has stated on many occasions his desire to secure foreign investment and respect private property. 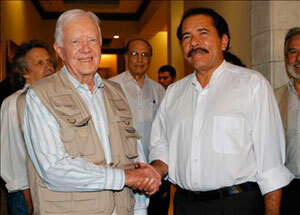 The evening following the election, Ortega told reporters after meeting with former U.S. president Jimmy Carter that “Nicaragua would continue to give security to the private sector, protect foreign and national investors … and work to eradicate poverty in the country,” as reported by the Los Angeles Times. Several analysts view Washington’s response to Ortega’s presidency as the largest uncertainty. While Ortega has stated his willingness to cultivate stronger ties with the U.S., Washington’s response to this gesture is unclear. Most importantly, anyone looking to own property in Nicaragua should know that Ortega has repeatedly stated his government will respect the private sector and private property. Political analysts agree that he will. The Washington Post reports that Ortega is “too pragmatic” to attempt confiscation of private property. In addition, neighboring Costa Rican president and Nobel Peace Prize winner Oscar Arias stated last week an Ortega victory represents no risk whatsoever for the region. La Nación, a Costa Rican newspaper, reported Arias is poised to work with Ortega and the Nicaraguan government for the further development and benefit of Central America. Considering Ortega’s express commitment to securing foreign investment and Washington’s hesitancy to warm up to a one-time foe, Century 21 Best Value Realty predicts a strong buyer’s market. Although some foreign investors could shy away from Nicaragua, Century 21 sees the present as an opportunity for savvy investors to get ahead of the curve. The situation here on the ground is calm and business continues as usual. “The waves are still great and the wind still blows offshore most of the year,” added Century 21 Best Value Realty’s General Manager, Barry Oliver. President-elect Daniel Ortega has agreed to meet with Century 21 Best Value Realty this week to discuss collaboration on social initiatives and foreign investment. Century 21 Best Value Realty has been helping investors realize the dream of owning Pacific Coastline properties in Central America for over 30 years. The friendly and knowledgeable Best Value Realty team has the experience and support of Century 21 to help you make an educated and confident investment decision. Visit us at http://www.c21sanjuan.com today!